The New York Red Bulls’ Alejandro Romero ‘Kaku’ Gamarra likely has a lengthy MLS suspension coming. Kaku drilled a fan in the face with the soccer ball during stoppage time in Sunday night’s 2-2 draw against Sporting KC, and was given a red card. It was a high-velocity kick and at close range. That’s certainly not a good look. And it looks even worse since the fan reportedly suffered a bloody nose and had to receive medical treatment. An update from a #SportingKC spokesperson on the fan that New York Red Bulls player Kaku kicked a ball at near the end of the match: Fan got a bloody nose and sent back to a conference room for medical treatment after the game. More updates to come. 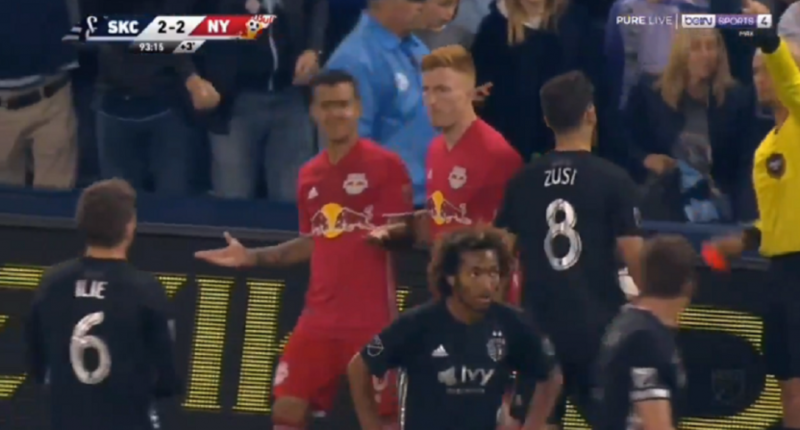 After the match, Red Bulls players went over to the fan to check on him and apologize for their teammate’s antics.